I thought I'd give an account of a typical concert. 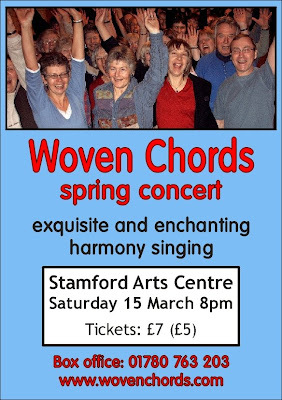 Woven Chords had their annual spring concert ‘at home’ in Stamford Arts Centre last Saturday. Since Stamford is about 1 ¼ hours drive away from where I live, I left home at 11.30am in order to arrive in plenty of time for our regular one o’clock rehearsal. We almost always have a rehearsal on the afternoon of a concert, definitely if it’s a whole evening by ourselves. I always feel safer! The rehearsal is mainly to make sure that people know the structure of each song, where to stand, what comes next, etc. I assume that the actual singing will be OK on the night! For a typical 1 ½ hour concert, we usually take 2 ½ hours to run through, including a warm up. I guess if we were a performing choir with many concerts each year, then we perhaps would only need a short technical rehearsal on the day of the concert. But people come along each week mainly for fun, so I try keep actual drilling of songs to a minimum in our regular sessions. We try to do a concert at the end of each term, making at least three concerts a year. Since I now run just one choir, I was rather nervous on Saturday before the gig as the last time I had stood in front of a choir was our Christmas concert in 2007. After the rehearsal I go and try to chill out somewhere and take some time to look through the running order, remind myself of any tricky bits in songs, and imagine myself starting each song (starting notes, timing, who to bring in first, etc.). We meet up again half an hour before the concert in order to finalise how we stand in the performance space (I usually put tape marks on the floor to ensure a nice semi-circle), to do a final warm-up, and perhaps to run through any tricky parts of particular songs. The venue for the concert was the beautiful Georgian ballroom where we practice each week. It is long and thin with a stage at one end. Once upon a time we used to sing on the stage with a few stage lights, but now the choir is so big that we no longer fit! For the last two years we’ve performed sideways on which means a wide audience of around five rows. This gives plenty of room for the choir to stand in a wide semi-circle. Although we have 80 members on the books, about 70 turn up in any given term. However, this term we only managed 60. Of those, quite a few were ill (there’s been a vicious chest bug going around since January) or otherwise engaged, so we managed just 45 singers. However, it seemed very full and all the audience seats were full. There could have only been about 100 audience, but it felt full and comfortable. They were very attentive and we could see the whites of there eyes as the stage lighting doesn’t work sideways on! For a full concert such as Saturday’s we get through about 30 songs. My yardstick is to multiply the total singing time by 1 ½ and that gives a rough estimate of the concert running time (i.e. it includes all my waffle between songs). So for two halves of 45 minutes each, we need 60 minutes of song material. And since our songs are usually so short, that means about 30 songs! For Saturday’s concert I tried to inject something a little different, so we began with the choir entering through two separate doors at the back, either side of the audience and launched into a call and response song from Polynesia (across the audience’s head). The choir then slowly moved into their proper formation and we neatly segued into a song from the Cook Islands. In the first half we had a Corsican song which was started by a trio of singers, two songs sung by the women only, and one by the men. Finally, I taught a South African song to the audience with the choir adding the harmonies. I always teach a song to the audience, but usually at the end. I thought I’d catch them this time before they could run away! Apart from it being fun, I use it to demonstrate my belief that everyone can sing, and also to give the audience a short insight into what it’s like to be part of a choir singing unaccompanied harmony. We got about five new recruits at the end of the concert! The second half began with a solo singer who was then joined by four other women, and finally by five other women to sing a beautiful Scottish round from the Hebrides. Gradually the rest of the choir joined in from behind adding drones. Next, the same women sang the old Medieval English round ‘Sumer is icumen in’ with the men behind them singing the ostinato. At the end of the second half I taught a final song to the audience, invited them to join in with the Beach Boys’ version of ‘Barbara Ann’, and then the choir exited singing a Zimbabwean lullaby. The audience seemed well-pleased, we sold a few CDs, and had some nice comments in the comments book.